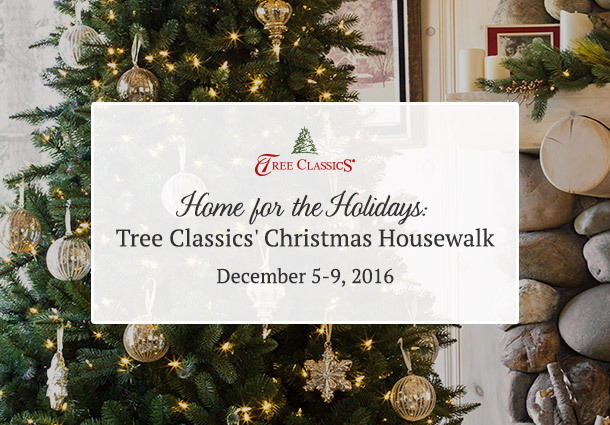 Welcome to Eleven Gables' Home for the Holidays, Tree Classics Christmas Housewalk. 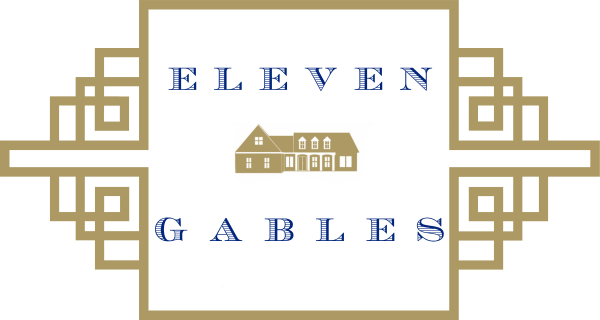 This post is sponsored by Tree Classics, but every opinion is my own. 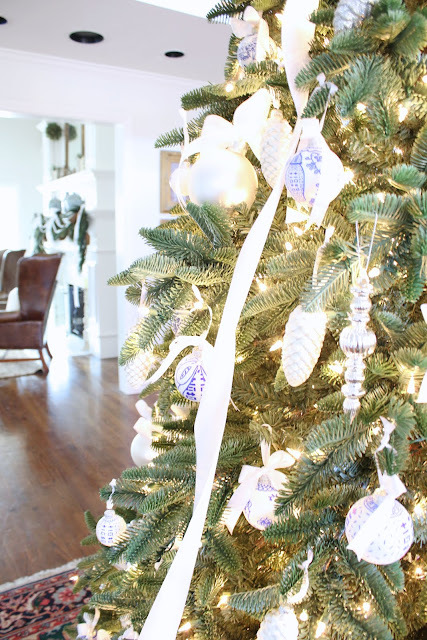 Tree Classics sent me this GORGEOUS Deluxe Noble Fir Pre-lit Snap Tree and I am in love! This was the easiest tree to put together and fluff. 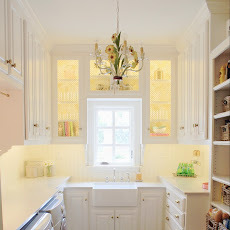 For a wonderful video on assembly by my friend at Maison Decor, go here. 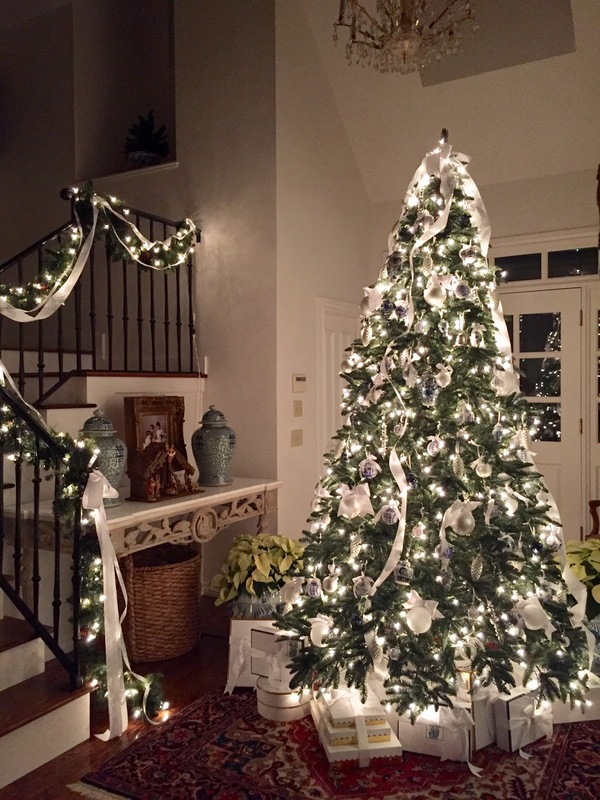 We have always done a family tree with treasured ornaments in the entryway, but this year I decided to put the family tree in the keeping room and have a "fancy" tree here in the entry. 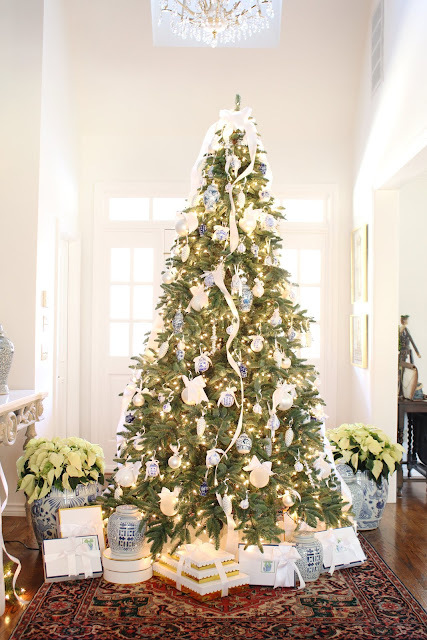 For the decor I made over 100 hand painted blue and white chinoiserie ornaments and tied them with white satin ribbon. 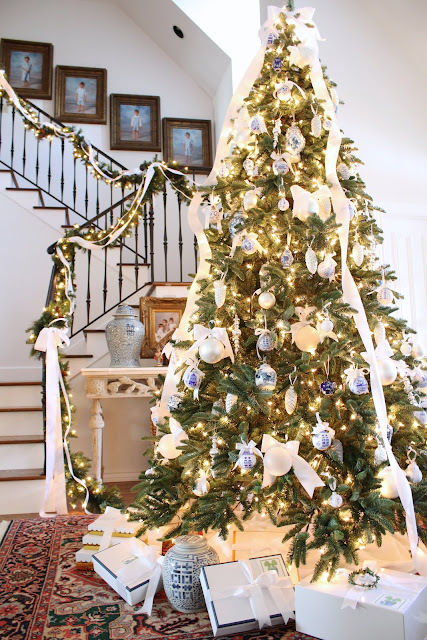 Double bows tied to the top of the tree with cascading ribbons down the length add simple elegance. 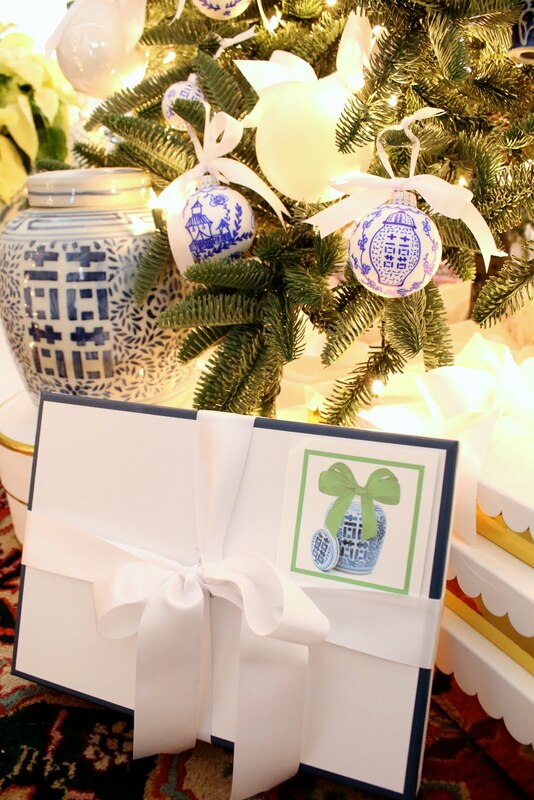 A few miniature ginger jar ornaments are sprinkled throughout the handmade ornaments. 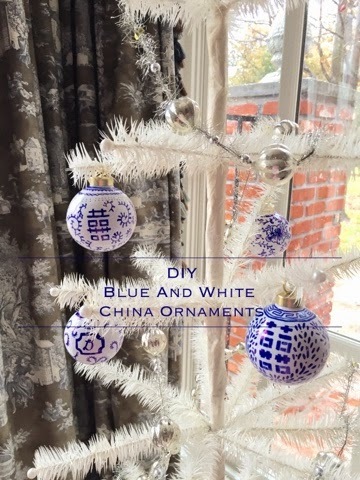 Below each photo are shopping links to where you can find like items and a tutorial for the chinoiserie ornaments is at the end of this post. But first, I was asked how I would describe my ideal Christmas. My ideal Christmas is being surrounded by my family. Waking up early to watch the boys come downstairs and shriek because Santa paid them a visit! Gathering together on the sofa and reading the Christmas Story together before diving into our gifts. We read THIS precious story every Christmas morning. It really gets to the heart of Christmas and is my boys' favorite because they can participate. After presents, we eat a big brunch. Then, we gather with loved ones for Christmas dinner, gingerbread house decorating, and games. Family is so precious to us. Being with them as much as we can, I pray, passes on the legacy of tradition to our children. Be sure and visit everyone on the Christmas Housewalk Tour and Come Back Monday to see more of my home dressed up for Christmas!! 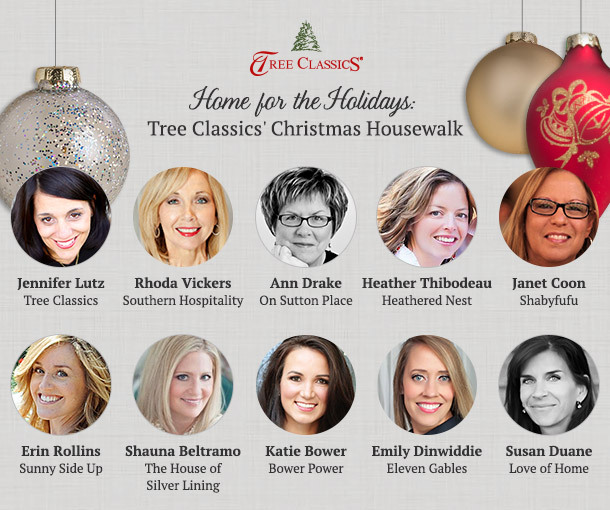 Tree Classics' 12 Days of Christmas Giveaway is happening here!!! You still have time to enter! Looks simply stunning! 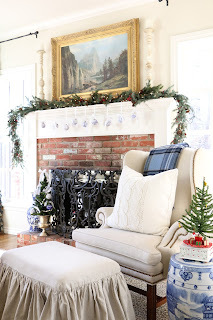 Elegant and welcoming, I'd love to pop into your place for a cup of holiday cheer! Thanks for the video link too. That tree is so easy to set up!! Emily, I just love your blue and white tree! Your house is just stunning! 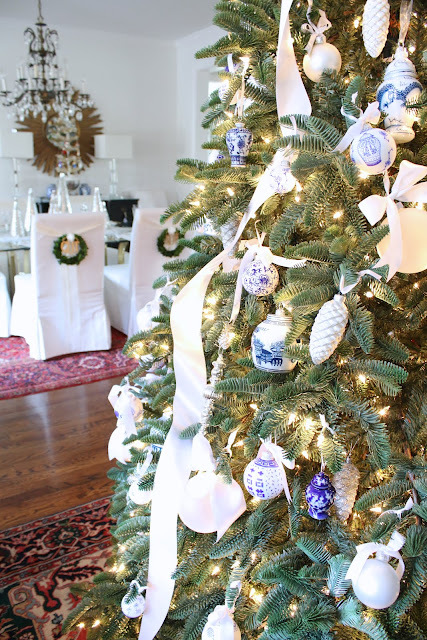 I can't imagine how long it took to make those 100 ornaments, but you go girl! 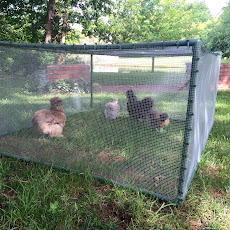 I've so enjoyed getting to know you this past year and look forward to more blogging together. Have a wonderful Merry Christmas with your sweet boys! 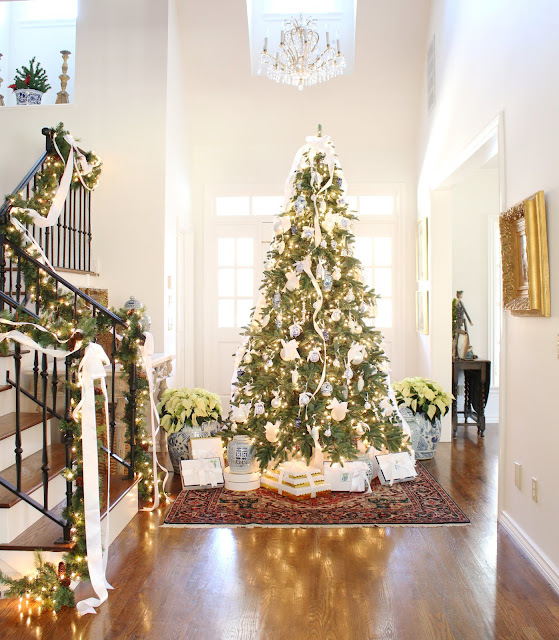 Beautiful tree, Emily and I love it in the foyer. You knocked this tree out of the park!! I bet the boys have to tread lightly through that space, huh? ;) Well done, sweet friend! 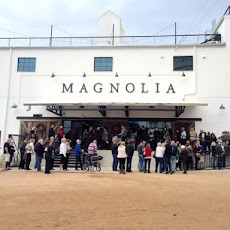 What a great holiday tour! I totally was singing the song while viewing your tour! What a clever idea. 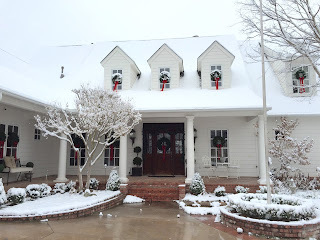 Your decor is gorgeous and I love your home. Happy Holidays to you and your family!